Magnetic knife rack made of solid brushed V2A stainless steel (1,5 mm thick). The usable area is 32 x 3,5 cm. There are 6 strong magnets on the backside, so your steel knives up to 500 g attach "magically." 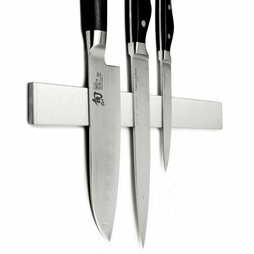 1 knife rack 32 cm, 2 countersunk pot magnets including rawlplugs and screws for wall mounting & mounting instructions. 1 pc. 99,99 EUR ea. universal use, set of 6, not magnetic! spaghetti measure, spoon rest and oven mitt, not magnetic! The brushed stainless steel lends a classy touch to the knife strip. There are 6 strong neodymium magnets on the backside. The knife strip will be delivered well cushioned in bubblewrap.